The Mitsubishi Eclipse is a sport compact car that was in production between 1989 and 2011. A convertible body style was added for the 1997 model year. 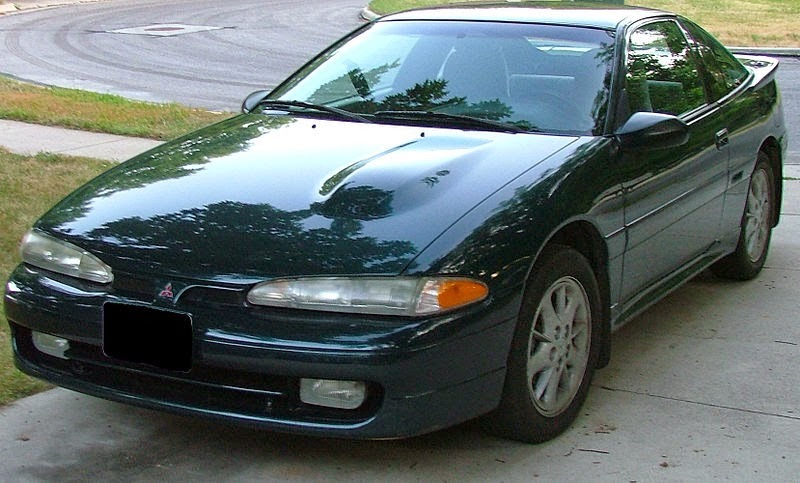 It was named after an unbeaten 18th-century English racehorse which won 26 races, and has also been sold as the Eagle Talon and the Plymouth Laser captive imports through Mitsubishi Motors' close relationship with the Chrysler Corporation. Their partnership was known as Diamond-Star Motors, or DSM, and the vehicle trio through the close of the second-generation line were sometimes referred to by the DSM moniker among enthusiast circles. In Japan, only the first two generations were sold at a specific Japanese retail chain called Mitsubishi Car Plaza. The Eclipse was officially marketed in North America, Oman, South Korea, the Philippines, Brazil, Saudi Arabia, Kuwait, UAE, and China. At the end of August 2011, the final Eclipse rolled off the assembly line, and was auctioned off, the proceeds donated to charity. 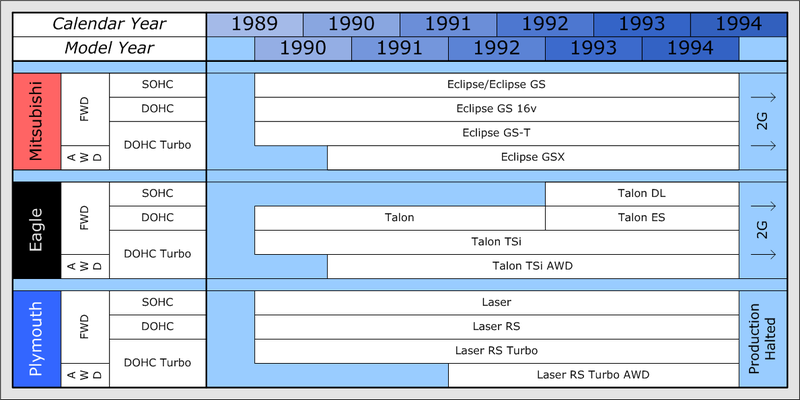 The Eclipse has undergone four distinct generations: the first two generations (1G and 2G) share the automobile platform with the Eagle Talon, and the Plymouth Laser, and share parts, while the third generation (3G) was based on a redesigned platform and most parts are incompatible with 1G and 2G Eclipses. During May 2005, the fourth, and final, generation (4G) Eclipse was introduced. 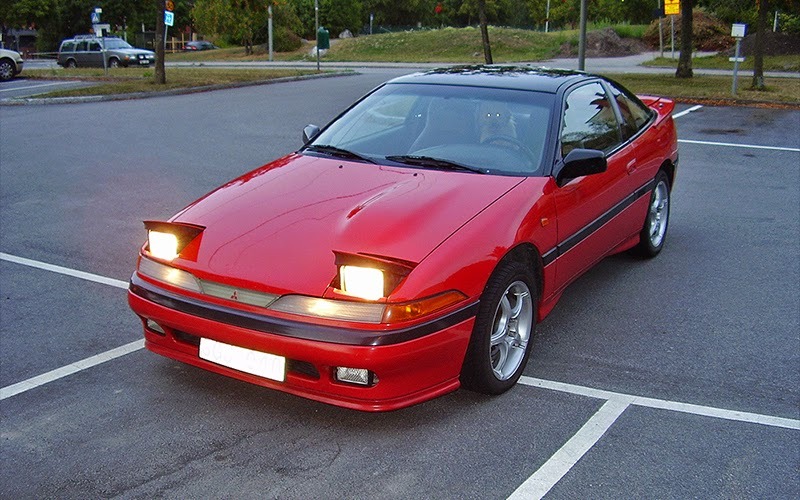 The first generation Mitsubishi Eclipse was marketed as an entry to mid-level four-cylinder sports coupe. Four trim levels were available: the bottom three were front-wheel drive and the very top was all-wheel drive. The top FWD and the AWD model were equipped with turbocharged engines. The car underwent minor changes throughout its production; 1992–1994 models (1Gb) have updated sheetmetal and are easily distinguishable from previous vehicles (1Ga). The most notable of these changes is that the 1Ga models have pop-up headlights. 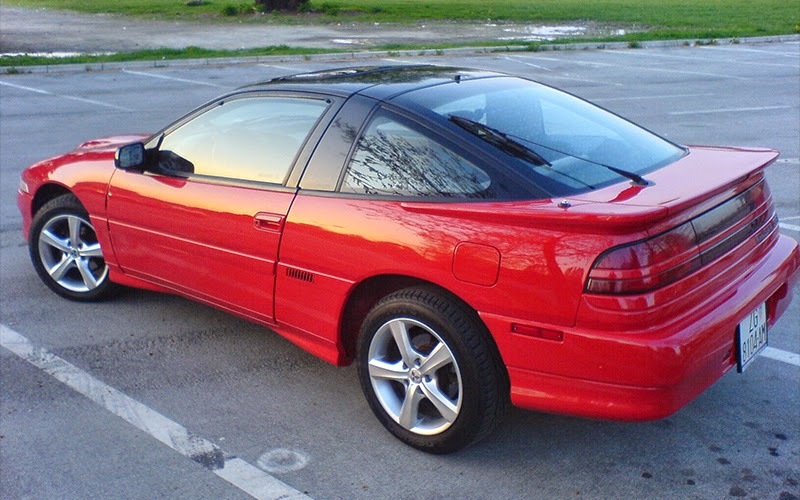 The Eclipse was revised into a new vehicle for 1995 and described as the second generation (2G). 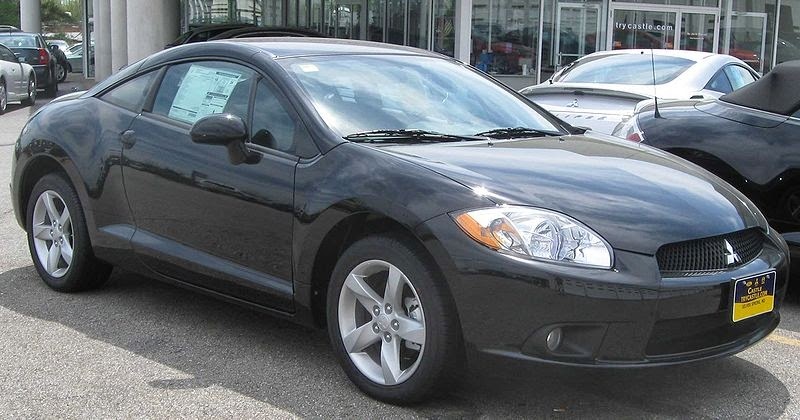 The Eclipse was available in five trim levels during its first-generation production run. AWD models were not available until halfway through the first model year. 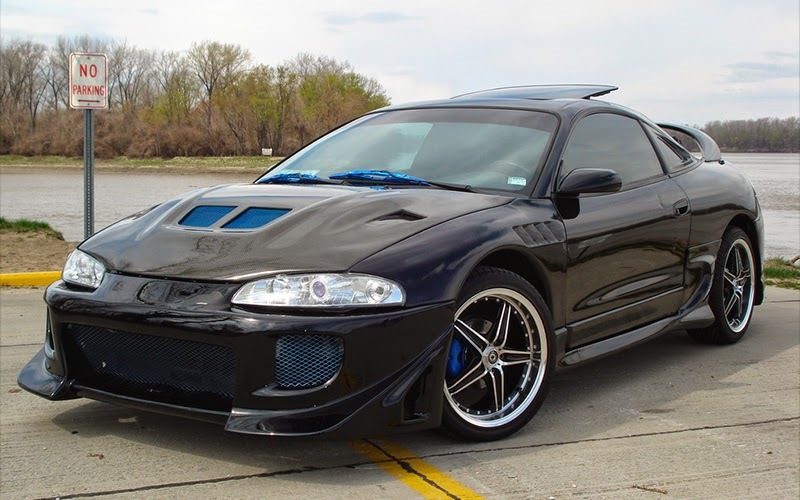 Eclipse GS DOHC AWD: Equipped with a 150 hp (110 kW) 4G63 16 valve non-turbocharged engine (AWD N/A only available in Europe) All were only available with 5-speed manual transmission and without rear limited slip differential. Sunroof, cruise control, ABS, central locking and A/C were in base. * The 1990 manual transmission turbocharged GST was rated at 190 hp, whereas the 1990 GSX manual turbo was rated at 195 hp (145 kW). This was for the purpose of offsetting the additional weight of the AWD mechanism (approximately 2,930 lbs Vs 2,570 lbs GVW). However, 1991 and later years of both turbo models standardized on the 195 hp version 4G63T. The automatic models were rated at 180 hp (130 kW) due to smaller fuel-injectors and turbocharger. ** 1990–1994 DSMs did not come with the 420A engine, which was not added until the second generation. These models varied significantly in drivetrains and available options, and included some variance in appearance, as higher trim lines added different front and rear fascia panels and surrounding trim, with the GSX model getting a notably different styling package from the others. The basic driveline layout of the Eclipse is a transverse-mounted 4-cylinder Mitsubishi 4G37 or 4G63 engine situated on the left-hand side of the car driving an automatic or manual transmission on the right-hand side. AWD models have a different transmission which includes a limited-slip center differential and output shaft for a transfer case, which drives the rear differential (also available as limited-slip) and half-shafts. The 4G37 and 4G63 engines are both inline-four gasoline engines. The 4G63 is composed of an iron engine block and aluminum cylinder head and is equipped with balance shafts for smooth operation. The turbocharged version of the 4G63 (sometimes referred to as the 4G63T) is equipped with a lower compression ratio (7.8 vs. 9.0 in the naturally aspirated version) and oil squirters under the pistons in order to better cope with the stress and extra heat caused by forced induction. There is also a difference between rear axle/rear ends on all-wheel-drive models. 1990-early 1992 cars have three bolts attaching the axle to the wheel hub. Late 1992–1994 have larger-diameter axles and attach to the hub with bigger, 4-bolt axle cups. The Eclipse Turbo was on Car and Driver magazine's Ten Best list for 1989–1992. The second generation car maintained the market focus of the 1G car, but had a major update in styling and had different engines between trim levels. New to the line was a convertible model, the Spyder, introduced in 1996. The convertible was available in two trims: the GS and the GS-T. The former was powered by the non-turbo 4G64 engine, and the latter by the turbo 4G63. The GSX (all-wheel-drive) hardtop model was also powered by this engine. There was no convertible model powered by the Chrysler 420a. The turbocharged engine option continued as the 4G63, but was modified for more power as compared to the previous generation (210 hp vs 195 hp). The non-turbo equipped car had two different engines depending on the market they were produced for. The US version engines were producing 140 hp, found only in the hardtop RS and GS trims, was a modified version of the Chrysler Neon engine, manufactured by Chrysler and delivered to and installed at the Diamond Star Motors facility. The Europe version engines were naturally aspirated 4G63 with 141 hp. From 96-99 the GS Spyders were mated with the 4g64 (2.4 L) naturally aspirated engine provided by Mitsubishi. The Talon was discontinued in 1998, along with the rest of the Eagle line, leaving only the Eclipse for sale during the 1999 model year. 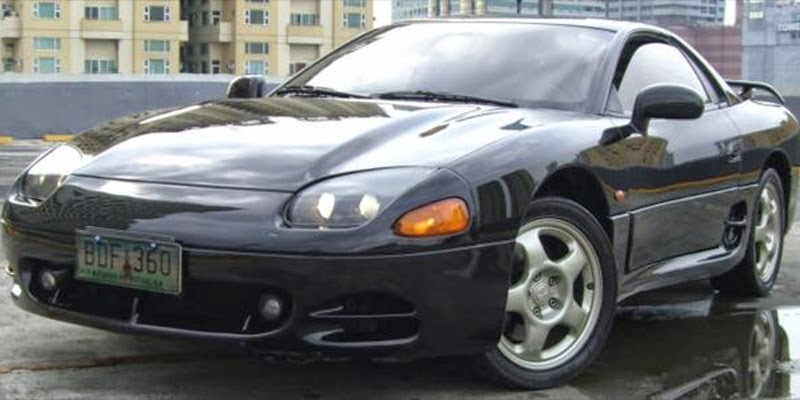 The Eclipse was available in seven trim levels: Base [Only available in 1996.5 (mid-model year)], RS (Rally Sport), GS (Grand Sport), GS Spyder, GS-T (Grand Sport Turbo), GS-T Spyder, and GSX (Grand Sport X=AWD). GS-T Spyder - 16" Alloy 5 spoke wheels, double tipped stainless steel exhaust, "low rise" spoiler for all years. GSX - 17-inch wheels after 1997, 1995–96 cars had 16-inch alloys, Grey painted panel around lower body paneling (1995–96), double tipped stainless steel exhaust, "low rise" spoiler(95-96), larger spoiler (1997–99), vented rear rotors (early 95) with dual piston front calipers. A minor style revision was applied for the 1997 model year. The front grille opening was given a more aggressive profile. The headlights were given a sharper slant on the inner edges, and the previous all-chrome fixture interior changed to a black interior with chrome reflector inserts. The driving lights were revised from a reflector type to a smaller projection type. The rear bumper cap was altered and had the reverse lights restyled and moved out into the bumper fascia, away from their original central position by the license plate bracket. The interior color choices also changed from blue, and grey in 1995–1996 model years to black/grey, tan/black, and grey in the 1997–1999 model years. The black leather interior option was only available in 1999; the package included all seats (with the 'Mitsubishi' logo embroidered on both of the fronts), door inserts, and center console armrest. A special version of the Eclipse, called the "10th Anniversary OZ Rally", was sold at the end of the 1999 model run with unique 16-inch wheels with the OZ Racing logo, though made by Enkei. It also included the leather interior package, accented exhaust exit, and hoop-style spoiler that were normally offered on some turbocharged models. The special edition package was only offered with the 420A engine. A unique version of the 2G Eclipse sold in some European countries. It used a normally aspirated Mitsubishi 4G63 motor, similar to what was available in the 1G, unique sideview mirrors, and unique amber rear turn signals. The Talon was available in four trim levels: Base, ESi, TSi and TSi AWD. 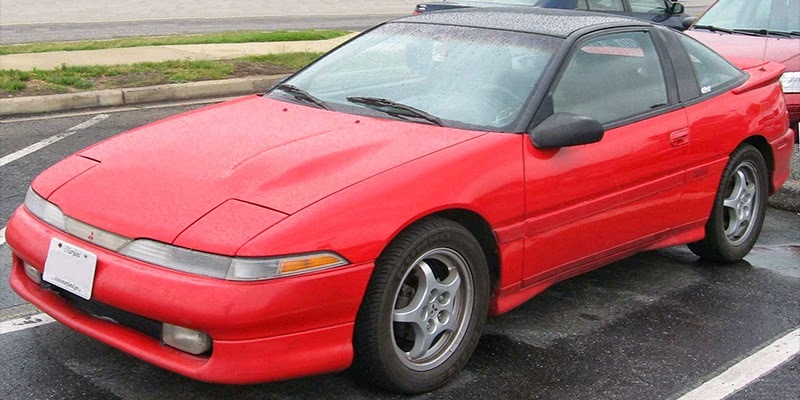 The Eagle Talon saw its production end in 1998 when Chrysler shut down the Eagle sub-brand, although the Dodge Avenger and Chrysler Sebring continued to be sold in variations that used the 420A engine and many of the 2G Eclipse/Talon interior components. There were similar alterations to the styling of the Talon as there were for the Eclipse. The basic driveline layout of the Eclipse is a transverse-mounted 4-cylinder Chrysler 420A, Mitsubishi 4G64 or 4G63 engine. The Mitsubishi motors are mounted in the same orientation as for the 1G cars. The 420A-powered cars had the engine mounted on the right side of the car, and further back in the chassis. AWD models had a similar transmission to the 1G car. The 2G GSX also had a stronger carrier/differential when equipped with the limited slip option. All motors are 4-cylinder gasoline engines. All have iron blocks with aluminum cylinder heads. The 4G63/4G64 engines retain the balance shafts for smoother operation, while the 420At does not use them. The 1995–1999 turbo engines were given an increased compression ratio of 8.5:1, up from 7.8:1, and a smaller turbo, a Garrett T25 in place of the previous Mitsubishi TD04-13G (automatic cars) and TD05-14B (manual cars). This was done to minimize turbo lag, which was an undesirable trait for mass-market appeal in the U.S. The 4G63 engines found in 1990–1994 models have a 60 mm throttle body compared to the 1995–1999 MY's 52 mm. The intake ports on the head and runners of the intake manifold are also larger. They also have larger crankshaft bearing journals to allow better lubrication. Mitsubishi Motors quietly updated its 4G63 engine in 1998 and 1999. The crankshaft is more precisely shaved and cut compared to previous years. It is identical to what one would find in a Mitsubishi Lancer Evolution, which was not yet sold in North America until 2003. The thrust bearings have been revised to a "split" type to allow better lubrication and self-alignment with the crankshaft. It also had improved tuning & functionality, thanks to a new ECU, which was similar to Lancer Evolution ECUs. The 4G63 was replaced by two powertrain options, a 147 hp 2.4 L 16-valve SOHC 4-cylinder 4G64 and a 205 hp 24v SOHC 3.0 L V6 (6G72). AWD was no longer an option. The suspension setup was adjusted to provide a softer and more compliant ride quality. The third generation Eclipse shared its powertrain with the 8th generation Galant. In late 2001, power was lowered to 200 hp (150 kW) as a result of tightened emission standards forcing MMNA to adopt the California standards for all variants of the car. In mid-2002, the GTS trim was introduced for the 2003 model year. This vehicle included an engine with a 10:1 compression ratio and an improved Mitsubishi Variable Induction Management (MVIM) air intake system that gave the car an extra 10 hp (7.5 kW) and a slightly improved power curve. The 2003–2005 GTS and GT/GTS Spyder shared the new engine while GT models retained the 200 hp (150 kW) powertrain. 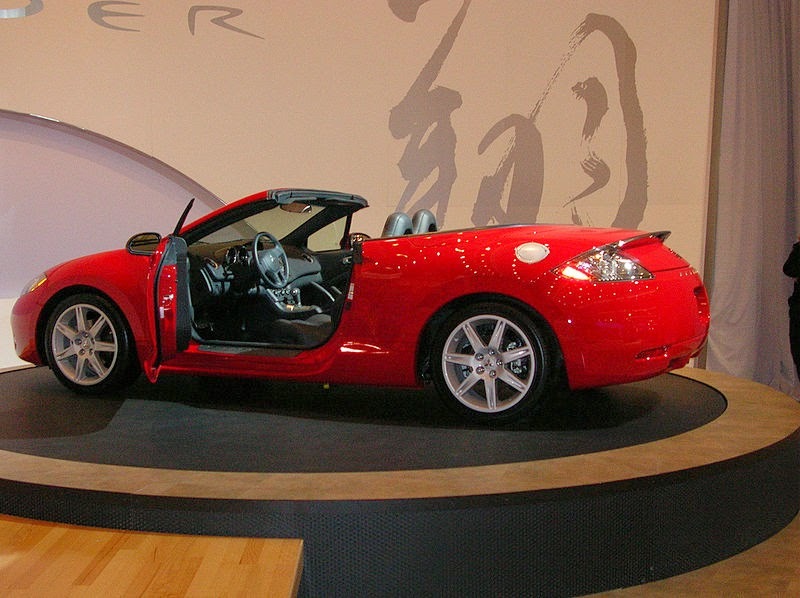 From 2003 to 2005, the Eclipse Spyder V6 was sold in a right-hand drive version in Japan. As this generation no longer complied with Japanese Government dimension regulations it was regarded as an expensive luxury car due to additional annual taxes from Japanese consumers. When the larger Mitsubishi GTO was discontinued in 2001, this generation became the only sports car Mitsubishi offered to Japanese consumers. 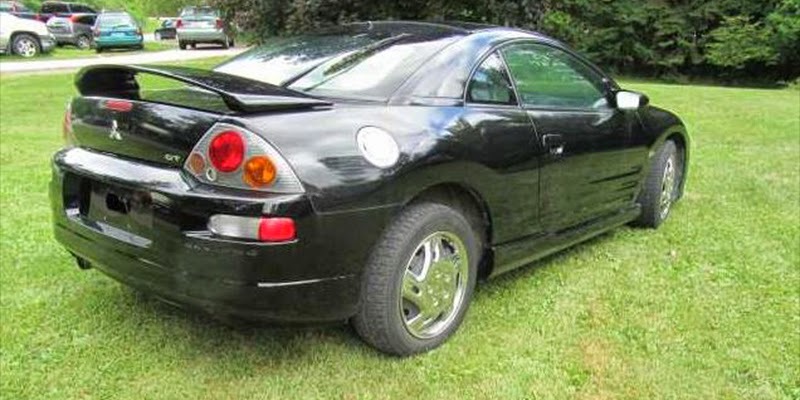 With the introduction of the 2003 GTS model, the Eclipse saw minor changes including a sleeker front bumper with slotted fog lights, as well as a recoloring of the tail lights. On the interior, the gauge face changed, and the door panels were redesigned. 2003 also saw the introduction of newly designed chrome, five-spoke wheels for the GT and GTS trims. The Eclipse was available in 7 trim levels: RS, GS, GS Spyder, GT, GT Spyder, GTS, and GTS Spyder. All trim levels (besides Spyder) came with an automatic tilt and retracting sunroof. All models were FWD. The GTS trims were introduced in 2003, the RS trim was dropped in 2005, and for that model year, they introduced the Remix Edition package only available on the GS and GS Spyder 4-cylinder with the same GS wheels now painted chrome, Remix Edition Badges, 6 Disc CD Changer and leather upholstery from some of the GT V6 models and all GTS V6 models, the first in stock 4-cylinder Eclipse history. Eclipse GTS Spyder: Convertible FWD model equipped with a 210 hp 3.0 L 24-valve SOHC Mitsubishi 6G72 engine with MVIM. Fed Spec: Fed Specs only affect 2000 and some 2001 models, Manufactured from August 1999 to late October 2000, these GTs came with 205 hp (153 kW) and 278 Nm (205 lbft). The Fed Spec GT is most recognizable for having one catalytic converter (cat) and two O2 sensors, with one sensor before the cat and the other after. Cali Spec: Cali Specs in 2000 were primarily shipped to California because of the more stringent emission laws; although other areas of North America received them as well. 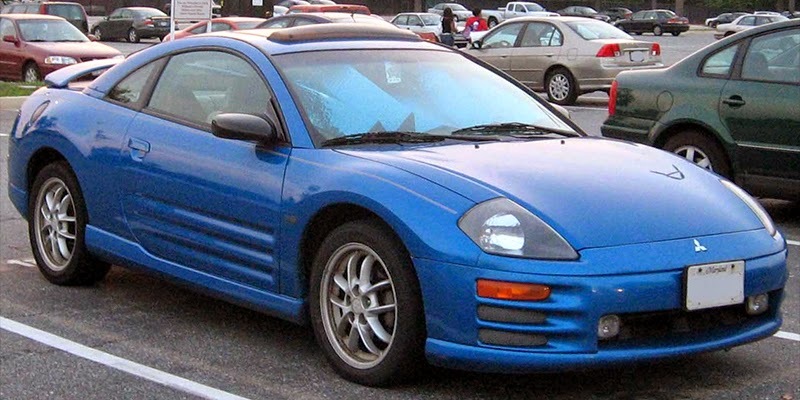 The Eclipse GT line was switched over for cost reasons to the Cali Spec, so only one version of the GT would be manufactured. Cali Specs came with 5 hp (3.7 kW) less and 6.8 Nm (5 lbft) less. Cali Spec emissions control are three catalytic converters and four O2 sensors. After each exhaust header is a sensor followed by a pre-cat then the main cat after y-pipe then two more O2 Sensors. The Mitsubishi Eclipse EV is a prototype electric vehicle with a lightweight electric motor and lithium-ion batteries in the chassis of a third generation Eclipse. It is powered by manganese lithium-ion batteries made by Japan Storage Battery, which have 65% reduced charging time over nickel-hydrogen batteries. It participated in the 2001 Shikoku EV Rally, a 780 km circuit around the perimeter of Shikoku, Japan, where it drove in excess of 400 km on a single battery charge. Another substantial styling revision was introduced, with the new model taking some of the profile from the second generation model but maintaining a front fascia consistent with Mitsubishi's current corporate styling features. Drivetrain features of the new model include a 263 hp (196 kW) 3.8 L MIVEC V6 for the GT trim, 2009 and newer models have 265 hp. The non-turbo GS has a 162 hp (121 kW) 2.4 L MIVEC I4, both derived from the Mitsubishi PS platform family, with which the Eclipse shares many mechanical components. Like the 2004 Galant, the new Eclipse is FWD only, although a concept model has been produced by Mitsubishi and Ralliart with a MillenWorks designed hybrid-electric AWD platform, the 4G63 engine from the Lancer Evolution, and more aggressive body styling with imitation carbon fiber accents. The V6 produces 263 hp (196 kW) and 350 Nm (260 lbft) of torque. For the 2010 model year in the U.S., its primary market, the Eclipse was available in five trim levels: GS, GS Sport Spyder, GS Sport, GT, and GT Spyder. In Mexico, the GT Spyder is known as the Eclipse Convertible. In Canada, the GT trim is known as the GT-P.
GS Standard- Choice of five-speed manual or a four-speed Sportronic automatic transmission, a 140-watt (max.) Mitsubishi CD/MP3-compatible audio system with six speakers, 17-inch alloy wheels, an anti-theft immobilizer, auto-off halogen headlamps, power windows/locks/mirrors, air conditioning, a split fold-down rear seat, two 12-volt accessory outlets, anti-lock brakes, a rear spoiler, and a six airbag safety system. Options Include - Sun & Sound package with a power sunroof is paired with a 650-watt (max.) Rockford Fosgate audio system. Boasting nine speakers including a 10-inch (250 mm) trunk-mounted subwoofer, a 6-CD in-dash changer, and steering wheel-mounted audio controls, the package also includes a center display with outside temperature and compass readings and an electrochromic rear-view mirror. A four piece body kit comes as an optional "aero kit" package for all models. GS Spyder - available for sale for the 2007 model year. Options Include - GS Deluxe Leather Package: Leather front seating surfaces. Heated front seats. Heated side mirrors. Outside temperature indicator and compass in center dash display. GT Standard- Choice of six-speed manual or a five-speed Sportronic automatic transmission, a 140-watt (max.) Mitsubishi CD/MP3-compatible audio system with six speakers, 17-inch alloy wheels, an anti-theft immobilizer, auto-off halogen headlamps, fog lamps, power windows/locks/mirrors, air-conditioning, a split fold-down rear seat, two 12-volt accessory outlets, 4-wheel anti-lock disc brakes, a rear spoiler, dual-stage six airbag safety system, traction control, a front strut tower bar, and a center display with outside temperature and compass readings. Options Include- Premium Sport Package with 18 in (460 mm) seven-spoke alloy wheels, leather front seating surfaces, a power sunroof, an eight-way-adjustable (six power) driver's seat, alloy pedals, heated front seats, heated door mirrors, automatic dimming rear-view mirror, air-conditioning and a 650-watt (max.) Rockford Fosgate audio system with nine speakers, including a 10-in (254 mm) trunk-mounted subwoofer, a 6-CD/MP3-compatible in-dash changer, steering wheel-mounted audio controls. GT Spyder - available for sale for the 2007 model year. Options Include - GT Premium Sport Package: 18-inch Alloy wheels. Leather front seating surfaces. 6-way power driver's seat. Heated front seats. Heated side mirrors. Aluminum pedals. Automatic climate control. Wind Deflector. The Mitsubishi Eclipse was given a minor facelift for the 2009 model year, the front fascia changed the fog lights and deleted the triangle housing the "three diamond" logo used to sit on in the grille; the rear fascia changed the "Eclipse" insignia from an indent to raised silver letters. An option to add a dual exhaust and projector H.I.D. headlamps also became available. The V6 engine now rated at 265 hp and 262 lb-ft torque. It was unveiled at the 2008 Chicago Auto Show. The 2011 Mitsubishi Eclipse featured a "blackout" roof, similar to the 1990 version. 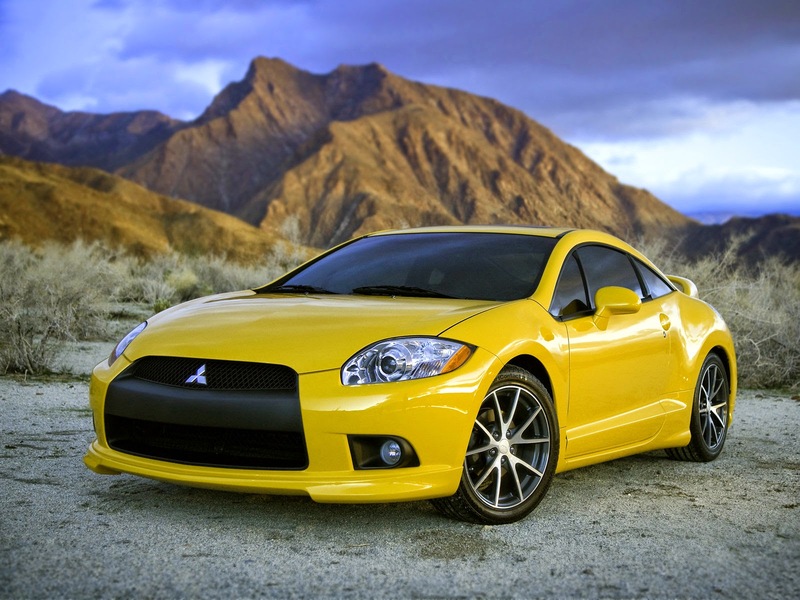 For 2011, Mitsubishi lowered the suspension of Eclipse about half an inch, which created a lower center of gravity. Mitsubishi also added a rear backup camera and Bluetooth hands free calling to the Sun and sound package. In the GS trim, the car gets the same 18-inch wheels and blackout front end as the GT model called the GS Sport. 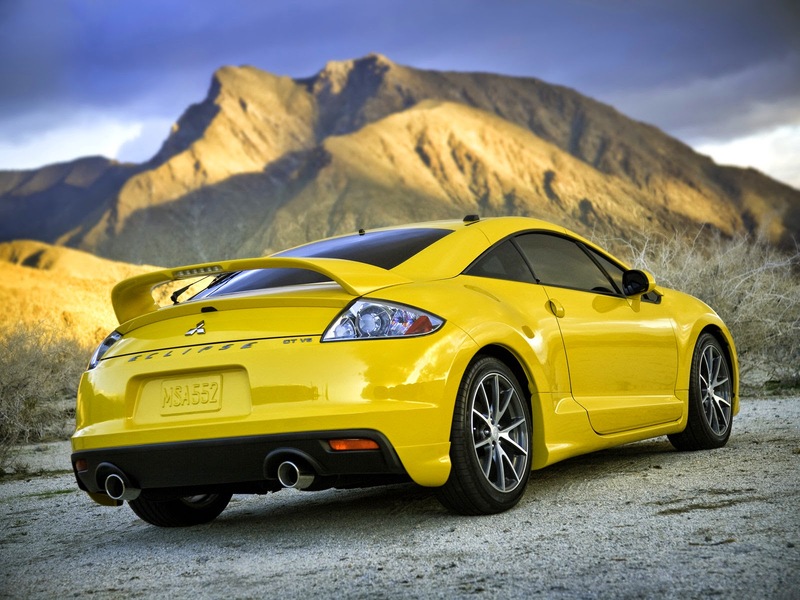 For the 2012 model year, the Mitsubishi Eclipse receives three (slight) changes: Brake override logic, a clear lip spoiler on the GT trim, and one new exterior color. This was the final model year, albeit a short run because production ended in August 2011. The last Eclipse to roll off the assembly line was built in August 2011, painted Kalapana Black, its color was chosen from by members of Mitsubishi’s Facebook community, who picked from a historical Eclipse color palette. 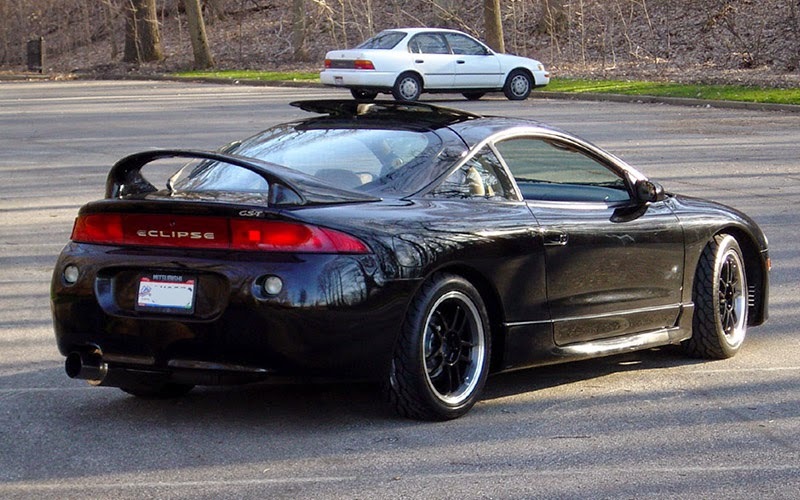 This was the only Eclipse equipped with both the 3.8L/265 hp V-6 engine and the commemorative SE package, as well as special 18-inch Dark Argent alloy wheels and one of a kind graphics. It is also built with a sunroof, leather interior, 650W Rockford Fosgate 9-speaker audio system with Sirius XM, hands free Bluetooth phone interface, rear-view camera, and HID headlights. The car was auctioned off by Mecum Auctions in St. Charles, IL on September 17, 2012, for $35,000. Proceeds went to the Japanese Red Cross to aid victims of the 2011 Tōhoku earthquake and tsunami. Grand total Eclipse production was 906,876 units. The Eclipse, and its DSM brethren, have seen competition in Sports Car Club of America (SCCA) events. In 2004 and 2005, Greg Collier won the NASA Super Unlimited class national title in a yellow FWD Plymouth Laser. In 2009 and 2010, a convertible Eclipse GST driven by Matt Andrews and Andrew Brilliant won the Super Lap Battle Limited championship in Willow Springs, California. In 2012, a heavily built and tuned Mitsubishi Eclipse piloted by Mark Rybníček won the Czech Hill Climb championship. Brent Rau has won three world drag racing championships using an Eclipse; IDRC, NDRA and NHRA. Many other notable names have also claimed big wins piloting Eclipses for drag racing use. Last updated on 19 July 2014 at 18:08.